Bombfest, a four-player local party game, was the first thing that caught my attention this morning at GDEX. I had an absolute blast with the game. I don’t want to show my age too much (who am I kidding, I refer to myself as “old” in every other post I write), but this game reminded me quite a bit of the PS1 classic multitap brawler Poy Poy. Like that game, four players start in a small arena, all self-contained on one screen. Then the game starts dropping bombs among the players, and chaos ensues. 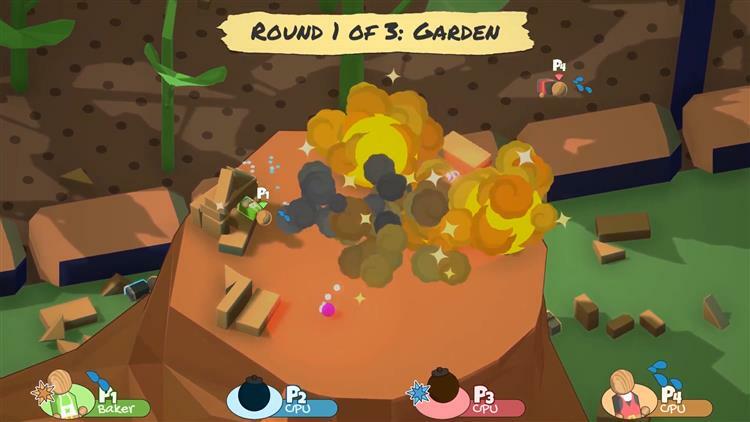 Players can pick up the bombs and toss them at their opponents. It is possible to “cook” a bomb, holding it until the last possible second, then hurling it at a crowd, leaving them no time to dodge out of the way. Getting blasted by a bomb sends players flying and getting knocked out of the arena ends the player’s ability to win the round. But in a great twist, the game respawns eliminated players as bombs, allowing them to continue to stalk and harass players still standing. Bombs can also trigger other bombs, allowing for great chain-reaction Worms-style coups. Many of the arenas also have inanimate objects scattered about that get thrown around by the explosions, shifting the playing field and contributing to the carnage. The game is in great shape already and is highly playable. The team behind it (just known at The Bombfest Team) is undergoing a round of funding via Kickstarter, and with 25 days left, they are less than $500 from their goal. The game can also be wishlisted on Steam, and more information can be found at Bombfest’s official site. If you are making your way to GDEX tomorrow, I highly recommend stopping by the booth and playing a few rounds. I won the game series I participated in, and the team gifted me with a little bomb pin that I wore around proudly for the rest of the day.